I wrote this post on the plane on the way home from MCN2011, trying to wrangle some sense from the myriad of stimulating and interesting conversations and sessions. It captures my first takeaways from the conference, and is something I will no doubt expand on in coming weeks. This was a very interesting conference. Much of the focus of the sessions and the conversations I participated in seemed to be really about the broad frameworks and implications of the work that is happening in the museum tech field, which was fascinating and useful. I got an incredible amount out of attending, and am already starting to think about how to get back next year. In our panel on What’s the Point of a Museum Website?, Koven raised the issue of museum authority online. He wanted to know how we should be visually building our websites to gain and maintain authority online, something he argues that we haven’t really earned in this space (gambling instead on the fact that our offline presence confers us with automatic authority online). Having said that, I think the issue is bigger than this. Our sector spends a significant amount of time and energy trying to find ways of making what we do inclusive and participatory. It’s one of the findings of the potential benefits of folksonomies and social tagging – to invite and acknowledge other voices. However, if the visual language (and actual language) we use online is one aimed at gaining authority (as might be expected, since this is still an important issue), then maybe that goes against any claim to inclusion. The austere appearance of our buildings is the same thing that makes them at times foreboding to those not comfortable in those spaces… if we design our websites to be authoritative, do we not risk the same thing in the digital space? How can we resolve these seeming contradictions in intention? Another issue that emerged for me particularly was a growing sense that for all the great work happening in our sector, we often seem to do a poor job of communicating the benefits of it to those outside our immediate community. Therefore, I want to know what big (or small) issues that the museum tech sector needs to become better at communicating to those outside our immediate community? How can we create a compelling framework/language for communicating the value of what we do to funders/directors/curators etc? New funding opportunities? New models for museum websites? What new funding opportunities might be available for museum technology projects if we can change the language/reshape the argument? If we can demonstrate our value beyond the financial in more effective ways, will there be new ways for attracting support for what we do? Similarly, are there new funding models that we could consider for the online space? In the discussion of one session, Nate Solas asked what would happen if we made all of our images available for free, but put a price on interpretation. It’s an interesting idea, and makes me start wondering further on what other new models we could investigate. I recently raved about my love for Bjork’s Biophilia app, which was released a few weeks ago. The app, which accompanies her latest album, brings with it depth, games, essays and ultimately, new discovery. It is super easy to get music for free online with so many file sharing sites. What is not so possible is gaining access to this same experience without paying for it – and it’s the first app I’ve really spent money on. What can museums learn from these sorts of creative solutions to content and context? This is one that came up in the Horizon Report (launched at MCN2011). How can we ensure that works of art that utilise technology (esp ones that might only function on a particular piece of equipment/OS etc) can be preserved? Can we create and set some industry standards for this practice, which individual institutions can then adapt to their own needs? How can we start ensuring that there are conservators adequately trained in both the ethical and technical issues that this will involve? And how can we do it fast, since we are already losing works to the ravages of time and obsolescence? Career path development and longevity. This question emerged out of some more personal discussions than actually out of conference sessions, but it is still a very significant issue. How can we create succession lines, and better opportunities for career development so that we don’t lose the best people in our field? How can we capture and archive our “museum” content that lives offsite, on platforms like Facebook? Is it problematic that so much interpretative content exists in spaces that we cannot necessarily harvest? In the History Museums are Not Art Museums. Discuss session, one crowdsourced history project was discussed in which people were asked to transcribe old documents. Before being able to transcribe, they were asked to join the site, and were given a short questionnaire that included a question that asked why the person wanted to contribute. It was estimated that 75% of contributors wrote a significant piece on why they deserved to be allowed to contribute to the transcription. It makes me wonder if there isn’t some value in actually raising barriers to entry in some cases of crowdsourcing, particularly when the quality of the work is important. I might be wrong on this, but there is something like the idea of “I would never want to be a member of a club that would have me as a member” is playing in my head here. Maybe sometimes communities want a sense of exclusivity that the easy access of the web takes away? I haven’t thought this through fully yet, but it’s something that I want to explore further. Rob Stein wanted to know if there was a way to measure for epiphany? Or, do our online metrics measure the right things? And if not, what are the right things, and how can we measure for them? Following on from that, are we doing enough to provoke epiphanies, rather than just trying to teach people things? This is something I am definitely going to explore at a later stage, but it seems to me there is a particular value in things that don’t have easy answers or ready conclusions. These are the subjects we dwell on, that stick in our minds (or at least in mine). These are the things that we keep coming back to. So why do we, in museums, feel that we have to teach (ie, to provide answers)? Maybe we would be far more compelling if, like the art and objects we display, we asked more unanswerable questions. What if we again became philosophical centres, rather than centres for education. In the History Museums session, there was considerable talk about equipping people with the means to conduct historical research. What if the emphasis of museums becomes less about education, and more about enabling people to think critically through issues – without providing the answers? This is probably something that already happens, particularly in the best museum spaces, but it does seem like a critical issue that could be addressed particularly well in the offline space. The museum website of the future? Does the museum website of the future become as critical and central to the museum purpose and mission as the physical building itself? What happens when we start thinking about our data as a collection of digital objects to be curated? Does the position of digital knowledge curator become as essential as that of object curator? Can we reconcieve our online collections data in new ways that can be more beneficial to both museums, and society more generally? …Ok, I think that is enough to get started. I am obviously going to continue to flesh out and develop these ideas in the coming few weeks, so stay tuned to this blog if you want to gain some insight into the nuance of the discussions that I had whilst at the conference. In the mean time, thanks to everyone who was a part of my MCN experience. It was absolutely incredible, and I cannot believe what an interesting, supportive and warm community I have become a part of. Special thanks to the ever-amazing and provocative Koven Smith for inviting me to be a part of his panel, and to the MCN scholarship committee and ArtsNSW for their support in making it possible. 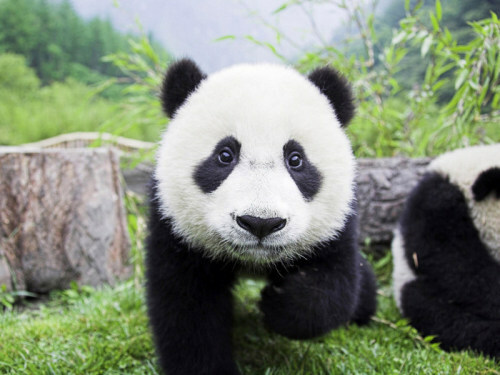 I leave you with pandas.